Click on Add to cart button below shopping cart. Purchased Bible Cartoons do not have watermarks. Links to Cartoons provided on email once purchase is completed. 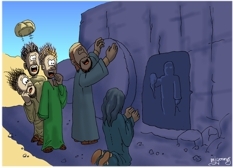 I drew “Lazarus raised” before the “Lazarus dead” cartoon. I established the lighting & colours here & then applied them to the 2nd cartoon, so as to maintain continuity. Jesus & Mary (kneeling.) 3 of Jesus’ disciples, or possibly mourners? I hadn’t decided to draw character sheets for each of the disciples at this point (that came during “Jesus anointed at Bethany” & “Jesus washes disciples feet”) Here I just wanted someone to look amazed & astonished at the sight of Lazarus raised from the dead! 01) (This page) John 11 – Lazarus resurrected – Scene 04 – Lazarus raised (Version 01). This scene is the “old” one, drawn in 2009. Version 02 & 03 are the “new” ones, drawn in 2016! 02) (Next page) John 11 – Lazarus resurrected – Scene 04 – Lazarus raised (Version 02). In which I have included dark blue shadows across the tomb wall & figures. 03) (Next page) John 11 – Lazarus resurrected – Scene 04 – Lazarus raised (Version 03). In this version I have removed the dark blue shadows, allowing full colour. There are cast shadows to the right of the figures & base of the tomb wall. This version is lighter for customers to project on screen &/or to print. All artwork, pictures and contents Copyright © 2009 - 2019 Martin Young.